Looking for a custom wood slab desk for you home or office? We have a unique selection of custom wood slab desks that are handcrafted from reclaimed and recycled woods. You can custom order a desk with the exact wood type and dimensions of your choice. Any log cabin or western style home looks amazing with a custom wood slab coffee table to entertain guests around. 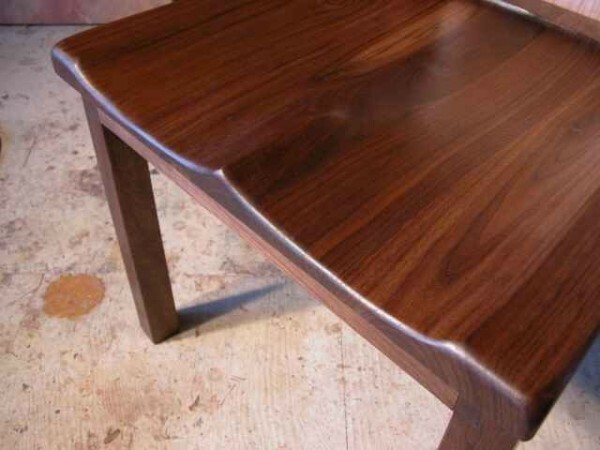 We have a wide selection of custom wood slab coffee tables built from live edge wood slabs. You can always custom order a coffee table to your exact specifications if you prefer. Bring a natural feel to your conference room with a custom wood slab conference table. We have a unique selection of custom slab conference tables built using reclaimed and recycled woods. You can custom order your wood slab conference table today! Bring a comforting feel into your bedroom with a natural wood slab bed. We have wood slab beds and headboards that are handcrafted from Walnut, Maple, Oak, and other unique woods. You can custom order a wood slab bed to your specifications or select one of our many pieces that are in stock. We have a wide selection of custom wood slab cabinets that are handcrafted from unique and unusual woods. You can custom order a wood slab cabinet to your specifications or select one of our many pieces that are in stock. We build custom wood slab kitchen islands from unique wood strains. You can custom order a wood slab kitchen island to your specifications or select one of our many pieces that are in stock. We have a wide selection of custom wood slab benches, from dining benches to outdoor swinging benches, we can build it all. You can custom order a wood slab bench to your specifications or select one of our many pieces that are in stock. We have a wide selection of custom wood slab chairs that are handcrafted from Walnut, Maple, Oak, and other unique wood strains. You can custom order a wood slab chair to your specifications or select one of our many pieces that are in stock.